The entertainment facilities at Woolacombe Bay Holiday Park in Devon have undergone a £4 million upgrade. 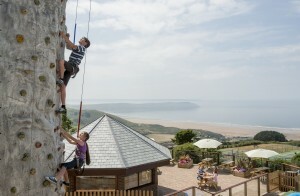 Easter saw the opening of the massive £4 million development at Woolacombe Bay Holiday Village in Devon. New facilities include a redeveloped family entertainment centre housing an all-day cafe with a sea view terrace and an entertainment lounge and bar. Other new highlights include a cinema, a children’s soft play area, a fitness gym, a pottery painting studio and an indoor pool with fun features. There are also new accommodation options including a raft of caravan holiday homes, such as the luxurious Platinum with central heating and double glazing. Sales and marketing director, Kevin Darvill said: “Generations of families have enjoyed holidays at our park, but it was time for an update with new facilities, more space and a true style injection.